Steve was born and raised in the Bay Area; San Francisco until he was 14. At 14, his Mom, Dad and two brothers moved to Belmont, California. Steve graduated from Carlmont High School in Belmont, California. Steve has two sons, ages 19 & 14 and one very large dog, named Bruno. Steve loves to ski; Alpine! Recreational activities also include camping and boating. He also enjoys riding his Harley Davidson. Someday he plans to build a vintage pan. Pacific coast routes are his favorite. If you cruising the coast you may just find him on his Harley! Steve has been in RV Sales for over 5 years this includes working at Manteca Trailer & Camper, Inc., the largest and most efficient Northern California RV Dealership. 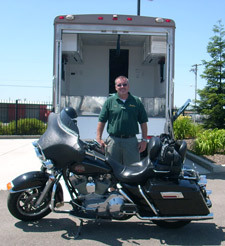 Steve spent two years at Brawley's RV in Modesto, right up the road from Dan Gamel RV in Modesto. Steve has helped many families find the perfect New RV or Used RV. Steve would like to make your purchase the best RV experience possible!